sqlfingers.com: What is SQL Server's default trace? Is it enabled? What is SQL Server's default trace? Is it enabled? If it's not, it really should be. 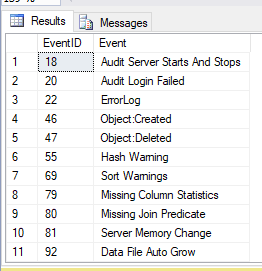 This trace is enabled by default w/your SQL Server installation; it is very light weight, and collects details about SQL Server activity that are useful when assessing server events, or troubleshooting problems. It is very useful for many things, but in this post I will just provide basic queries to see if it's enabled/running, what events it captures, and a couple examples of reading the default trace output file. That max_files setting is important. Say you had a problem a few minutes ago and you need to see what the trace captured. Well, if your system is busy, those trace files can be overwritten pretty quickly... so you shouldn't waste any time getting in there. Note those missing column statistics!!! That shows you that the default trace can also be used to observe performance conditions such as missing column stats, hash warnings, etc. As I said, there are many different uses of the defaut trace data capture, but this should get your started. I will post more later.